Sometimes the sunsets are grey and black; noir, even if the day has been bright in every way. The clouds form, lengthwise like fingers; blown together and apart, together and apart as if the gods, whose fingers are probably made of clouds seek to tease those of us on the ground looking up, with remnants of light. You can have a normal day, so unremarkable you don’t even think about anything extraordinary at all and then you see that light shining between and out of the clouds, spreading along and down in a fan-like shape that is almost invisible, that is so thin it would be impossible to measure. And you feel something greater than yourself fill your heart. The water in the bay churns, peaking as if pulled up on strings and you wonder if the light, the fingers have anything to do with it. The wind is slight, ineffectual, too weak at this moment to move even a blade of grass, let alone a body of water; yet the water continues to crest. Is it the gods cooling their fingertips after all that work with sunlight and clouds? At the horizon the world is a silhouette, daubs of black and shadow. The darkness unfolds like an elegant lady letting down her hair at night. The reaches of clouds, long as the sky, open and close one last time. Leaves swirl as the wind rises, gliding into the water. The power of the light diminishes, pulling up its blankets; ready to fall asleep. There is something quite magical about light…just love that photo. I couldn’t believe it when I saw it because the ray of light didn’t look that apparent to me. Maybe it was angelic intervention…. It does look a bit like a waterfall, Mags. And I know how fond you are of waterfalls. I love that about you! Perfect for your lovely picture. I love the lady letting down her hair simile…nobody does introspective like you do! Thank you so much for noticing that one, Timoteo. And yes I am vying for the crown of Queen of Introspection. Haha. This is what I mean, this eloquent, introspective and descriptive way you have of writing. 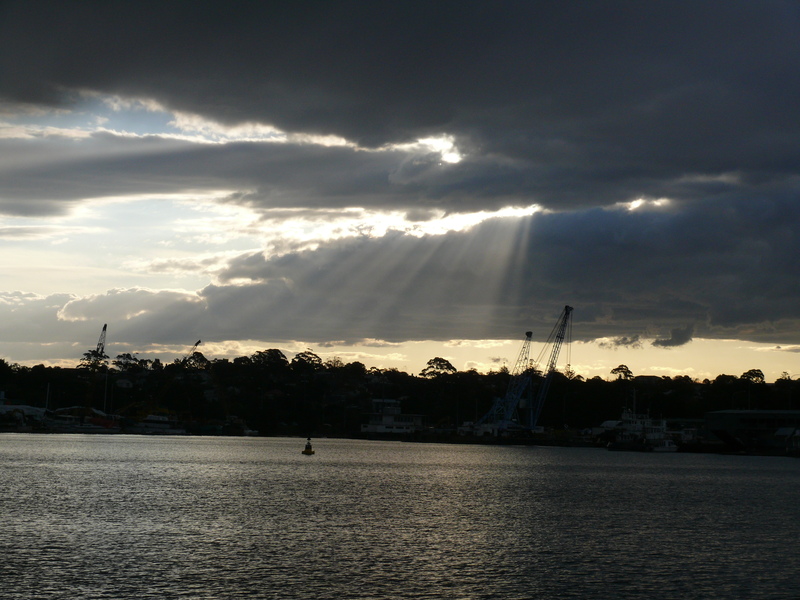 The beams, even in shades of grey, are like the dawn of glory. I couldn’t believe the light shining through when I saw the photo, Cathy. I think it was an absolute fluke because I really don’t have the technique to set something like that up. I am so pleased I got the opportunity to catch it. Beautiful post & amazing photo. Oh yes. I completely agree. And for once, I think I fall into the better light category with this one. The photo gods were smiling on me! Awww thank you, Linda. So nice of you to say so! Oh you inspire me. Beautifully said. Awww thank you, Gabe. That means so much to me!